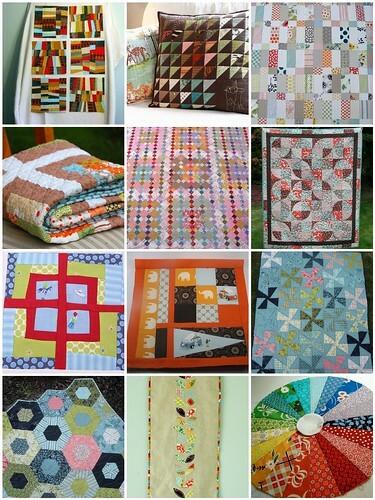 My Itty Bitty Quilts: It's a Block Party! BlockParyMosaic, originally uploaded by myittybittyquilts. I can't even begin to tell you how excited I am to be a part of an online Quilting Bee! I've been drooling over many other bloggers creations for each other, but I've never been able to take a part. I was mulling over the idea of inviting a few friends to start my own, but when I saw that the Block Party blog started a flickr group, I rushed over and found many Bees starting up. I've had the chance to check out my fellow quilters blogs and flickr sets and I'm even more stoked! I think we have an excellent group! Isn't flickr inspirational? I love browsing the endless quilty photos, and like you I have to watch my time spent. Little ones get restless while Mommy browses the internetz!! Nice job on the collage, all those quilts are gorgeous!! I am a SAHM mom of three beautiful kids and married to a handsome Veteran. I love to make things and I especially love to read about others making things!